The father and step-mother of a 13-year-old boy held captive inside a false wall appeared in court this morning to answer charges of child cruelty. 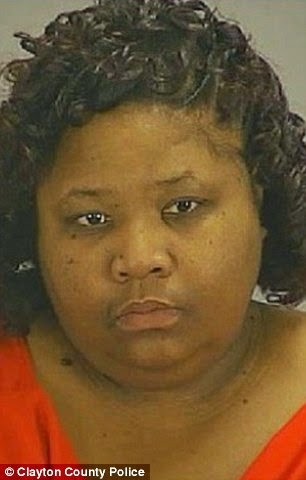 Gregory Jean, 37, and Samantha Joy Davis, 42, are both charged with the false imprisonment and cruelty against his son at their home in Jonesboro, a suburb of Atlanta, Georgia. The boy went missing four years ago, when he went to visit his father in Georgia. He was found this weekend after downloaded a texting app on his phone to reach out to his mother in Florida, writing that he had been beaten by his father. Davis is accused of striking the youngster with a stick causing him physical harm and imprisoning him in a hidden section of a garage at the family home. 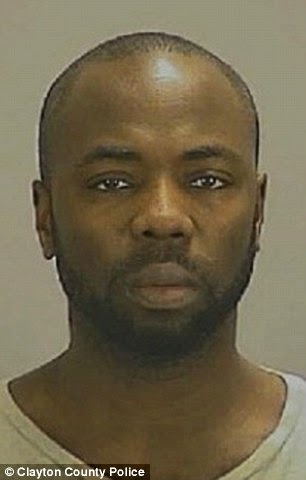 Jean Senior is accused of cruelty towards his son - that is parental neglect by failing to protect his son from physical violence and imprisoning the boy in an attic section of the garage. Davis spoke only to answer her name and appeared downcast as she sat in court in green county jail clothes. Jean Senior appeared more forthright and told the court he was originally from Haiti but was now a U.S. citizen. He works for TV cable company Comcast, he told the court. He was wearing the Clayton County jail regulation orange fatigues. Judge Richard Brown refused both suspects bail and they were remanded to Clayton County Jail until their next appearance on December 9th. 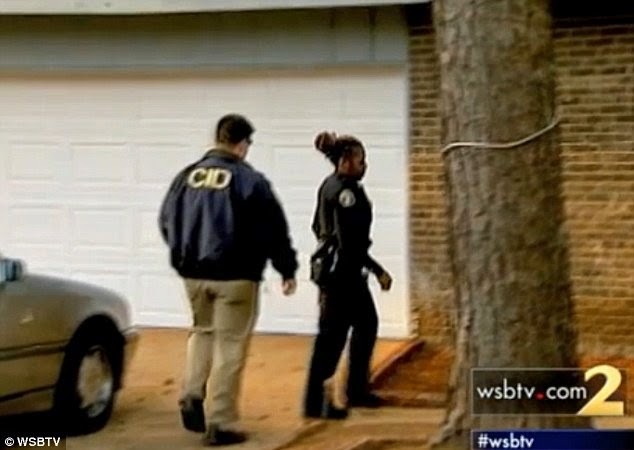 Neighbors in the Atlanta, Georgia suburb where a 13-year-old was found living behind a linen closet on Saturday, have spoken out to say they saw the boy often and never knew he was being held against his will. 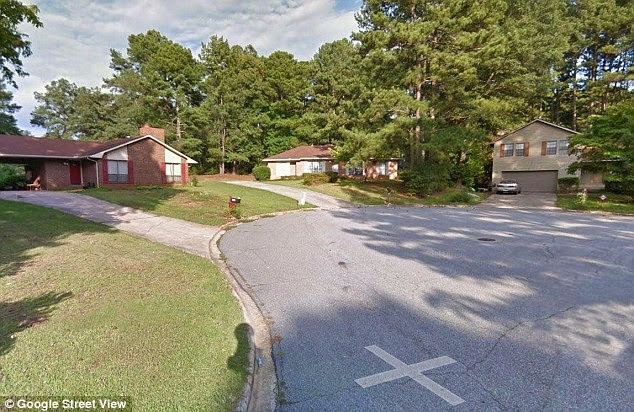 Jean's neighbor's in the Atlanta suburb of Jonesboro were shocked to hear that the boy was a prisoner. They say they often saw him outside the house, sometimes doing yard work. 'It was a shock to all of us. They were really nice people, very open they said come over anytime you want,' neighbor Julie Pizarro, who lives across the street told WXIA. 'The young man didn't seem under any distress. The boy was reported missing to child welfare authorities in 2010 after he went to visit his father and he refused to return him to his mother, according to WSB-TV. However, his mother never contacted the police, potentially because she is an immigrant and was unfamiliar with the system, it is said. But after receiving her son's text this weekend, she immediately called 911. Following her call, officers arrived at Jean's home at 2am on Saturday. They reportedly questioned the house's uncooperative occupants for several minutes before locating the victim in a linen closet in the garage. 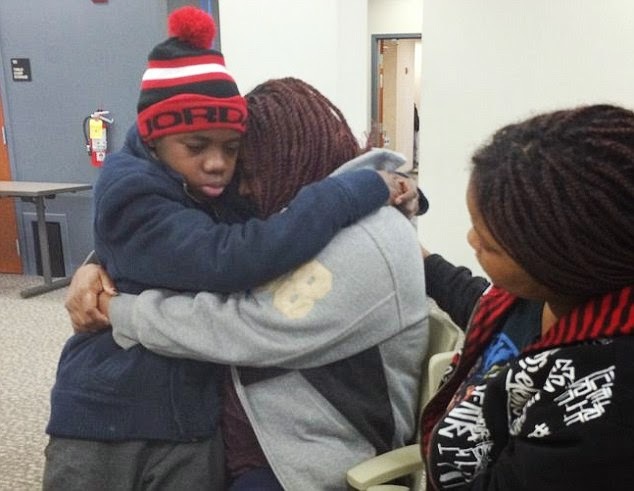 The boy repeatedly thanked officers for rescuing him, according to reports. In heart-wrenching scenes on Saturday morning, the victim was pictured clinging on to his weeping mother, who had traveled to Georgia, as another female relative sobbed uncontrollably nearby in an emotional reunion. Sargent Joanne Southerland, of Clayton County Police Department, told the news station: 'We came here to the home and were able to get inside and talk to the people inside. Officer Daniel Day added: 'I just couldn't believe it. We found him, we saw him. To say it was a great feeling is an understatement. Police have now requested a search warrant for the property. A spokesman said they still have a lot of unanswered questions, including how the boy was imprisoned for so long without intervention. The boy, whose legal custody is believed to lie with his mother, is expected to remain under the protection of the Division of Family and Children Services for the next couple of days.